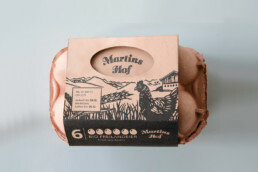 The eggpack design for the grocery store stands out with its unusual shape and the monochrome color scheme which refers to the organic and eco-friendly producer. 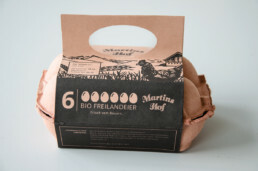 The unique benefit is the handle which gives the impression of personally taking home an egg basket directly from the farmer. 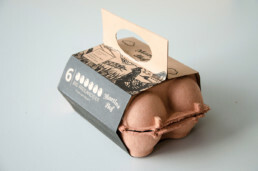 Because of this benefit and its design and shape, it sets itself apart from all the other ordinary egg boxes on the shelf. (Logo and illustration credit belong to Martin’s Hof.) 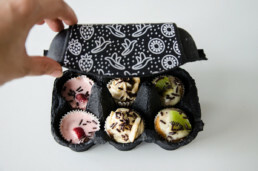 The cupcake packaging is designed with illustrations of the three different tastes of the cakes in the carton. 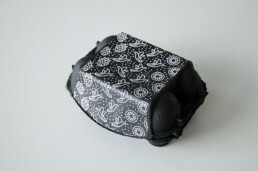 Despite the cheap packaging material, a high-quality product is conveyed because of the modern and stylish design. Also, the material doesn’t have to look unattractive just because it’s cheap. 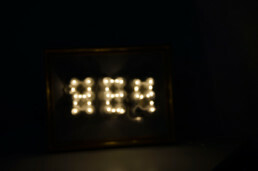 The created art object is intended to give the egg boxes value and a decorative benefit. 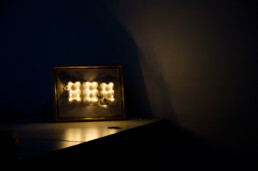 Together with a string of lights, they were used to create typographic light and illuminate the room in a unique way. 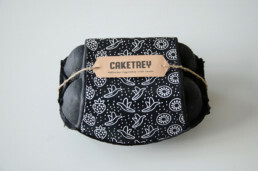 This project was featured on Packaging of the World, Chois Gallery, and the newsletter of Design Austria.